It pays to read these things carefully. Tuition at private non-profit colleges increased at 4.6%, but adjusted for inflation this was a 1% increase, one of the smallest in the past 40 years. And again, these are published prices: student aid is up 7% which means this is less a story about spiraling college costs, and more a story about private colleges using increased price discrimination. Which could be a fascinating story, if we cared to dig into it. However, research by Zajonc, Heingartner, and Herman (1969) argued that such conscious, cognitive processes weren’t necessarily an important component, as cockroaches, which presumably do not have the same conscious processes as humans, showed the same social facilitation effect. In this same experiment, Zajonc and colleagues also found that the cockroach’s performance decreased in the presence of other cockroaches when the task was particularly difficult. In the landmark article, “Social facilitation”, Robert Zajonc offered the theoretical explanation that the presence of others increases physiological arousal. During this state of arousal, he argued that performance increases when task is easy or familiar, while performance decreases when a task is difficult or unknown. As such, social facilitation effects came to be understood based on two components: the presence of others and the ease of the task for the individual. I’d love to link to the original article, but it is locked up in some Elsevier safe somewhere, despite being a classic article that is at this point over forty years old. I’m on vacation, and catching up with some reading. Dan Ariely’s book on the Upside of Irrationality is so far decent, though a little too chatty at times (I like a little less of the human interest backstory, YMMV). In any case, one thing I plan to do over the next couple days is find and read some of the studies I hit in it that I find interesting. 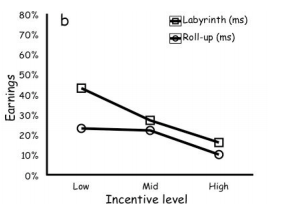 This one is pretty neat — an experiment with motivation through money and social stress that appears to confirm the existence of Yerkes-Dodson Law in humans — as potential monetary/social reward increases, performance increases then decreases. In the case displayed above, the small rewards appear to have been set too high, so you don’t get the full curve here, but the deterioration at higher levels of payment is pronounced. And yes, I know you’ve probably seen Dan Pink cover a portion of this study — but do you want to spend your life watching TED videos, or do you want to read some research? Right. I thought so. Yep, it’s me, Mike Caulfield, and it’s a new blog. Don’t want to talk about it right now. Here’s slides with notes from my USNH AT Institute keynote. Where I wrote the presentation in the notes. After advancing each slide, just click that “actions” menu at the bottom and the text will pop up. I’ve been playing with disfluency in slide design, and I like the results. Feedback welcome. And although I do this on the last slide, thanks to Jon Mott, who gave me the idea for the Bloom tie-in, in his 2009 Post-LMS Manifesto.